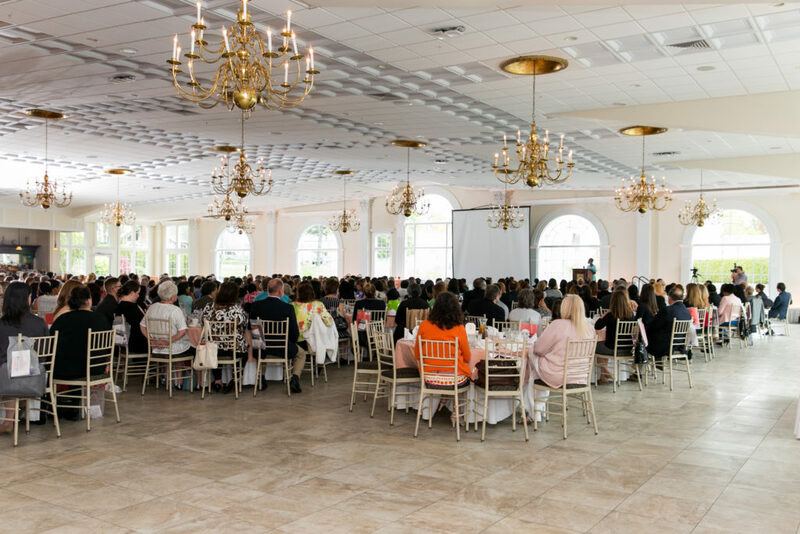 Over 400 friends and family gathered to honor women leaders, and up and coming student leaders, in the central Connecticut community at YWCA New Britain's 17th Biennial Women in Leadership Luncheon. The honorees were saluted for their extraordinary personal and professional accomplishments. Each honoree promotes the YWCA mission of eliminating racism and empowering women; shows outstanding achievement as a volunteer, contributing to the betterment of her workplace, neighborhood or community; and demonstrates exceptional and superior abilities and accomplishments as a pioneer, innovator, leader, and role model. Our extremely accomplished 2017 Academy of Women Leaders includes women who are working tirelessly for gender equity and social justice on our college campuses and in their workplaces; they are making sure other women have access to childcare and employment support services; they are connecting the business community with school districts creating opportunities for students and teachers to excel; they are leaders in their churches and faith-based organizations, caring for the sick and the elderly; they are working in the neighborhoods where they live building safer, stronger communities; they are working with families and children who are most at-risk; they provide employment, recreation and housing for people with disabilities; they are innovators in transportation, construction and engineering; they inspire philanthropy; they work tirelessly on behalf of children’s health and to end the opioid epidemic and create housing for women in recovery; they are exceptional coaches, super-lawyers, trail-blazers in male dominated fields; they are working to end human trafficking,to find a cure for breast cancer, and to make sure all children can read. Honoree Jean Alicandro, Director of Residence Life at Central Connecticut State University said she was surprised and humbled when she received notice that she was being honored, "My first thought was that I work with a lot of wonderful women, so this is really special." Emcee Rachel Lutzker, traffic reporter for FOX 61 Morning News and various radio stations throughout Connecticut, called each honoree up to be recognized by the group and to receive their award. Even during the ceremony, the honoree's dedication to their cause or organization was obvious. Adding some lighthearted fun to the event, one honoree, Yvette Ghannam, chanted into the microphone, "CCSU, CCSU!" Central Connecticut State University's Office of Community Engagement, of which Yvette works very closely with, was the organization that nominated her. Yvette said the office had jokingly promised to make a donation to a CCSU fund in her honor if she gave them a shout out. Many honorees received cheers and standing ovations. Keynote speaker Karen Hinds, Founder and CEO of Workplace Success Group and author of several business books, shared her story of personal success with the audience. 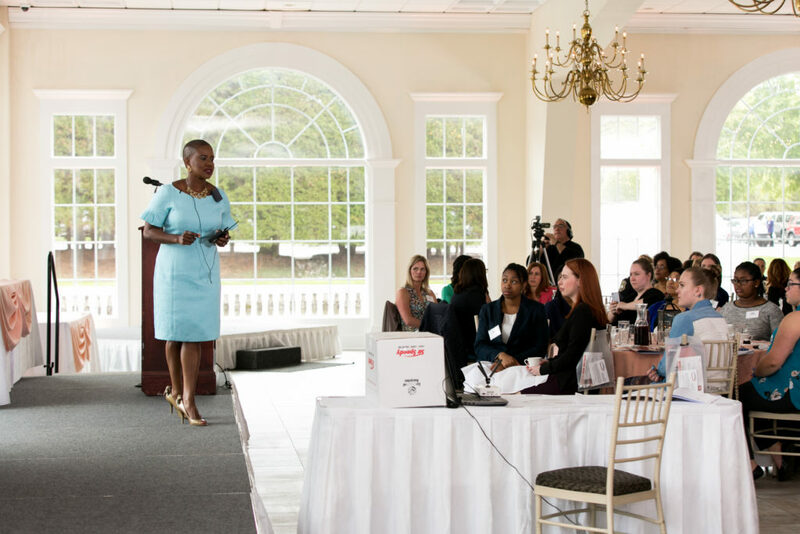 Karen engaged the audience with personal stories about her education growing up and how the challenges she overcame led to her eventual career as an entrepreneur. She also provided a networking opportunity at the beginning of her speech for student honorees to look for a mentor nearby. "The one particular [message] I took away," said St. Paul Catholic High School student honoree Jaymie Bianca, "was the phrase 'bloom where you are planted.' I found this to be incredibly true. I left the luncheon feeling inspired, and will remember to bloom in every journey I decide to take in life." Congratulations to the 2017 Academy of Women Leaders!